There are a number of items to consider when choosing the materials for a new fireplace. While a fireplace has an aesthetic appeal and can increase the value of any home, it must also be safely functional. Fireplaces are traditionally pictured in log homes and cabins; however, this is one of the most common elements sought by all home owners. Safety and function are of course primary, but style and beauty are important as well. It is important to hire a professional to install the Fireplace Atlanta or remodel the existing one. This will ensure that it is not only beautiful and safe, but will last much longer. Proper installation and care of a fireplace keep it burning in the family for years. Old fashioned stonework offers widely varied features of style and price. Mother Nature supplies this material which ensures its efficiency. It is also an option that offers unique and elegant style. Within the stonework category are the choices of random shapes or round rock. A stone fireplace is extremely energy efficient as long as it has been properly installed. It requires time to heat up; however, once it is sufficiently heated it will retain warmth for several hours up to a day or even two. Synthetic stone is another option to be considered for the fireplace. The texture, size, and color of a hearth add individuality to it and the home. Installing a new stone fireplace requires a sturdy foundation for it because the stone weighs a great deal. Synthetic stone may be used in place of natural stone. It can add exquisite appeal to the room and is much lighter than the traditional option without sacrificing durability. Slate is another popular choice which offers a wide array of different looks. It is marketed as honed, polished, and natural designs. Changing the finish alone provides many style options from a marble appeal to natural finishes which are ununiformed and lend the hearth an old time, rustic look. Marble fireplaces provide the home with a graceful, sophisticated appeal. Marble is offered in a large variety of color and natural veined patterns. The play of firelight off of the shiny marble give homes a glowing, elegant appeal. It was one of the most expensive material choices; however, advancements in finishing techniques the price has been measurably reduced. Brick materials offer more versatility today than many home owners realize. It is available in many colors and can be painted to tailor it to individual taste and is energy efficient. Brick cannot be constructed in one location and transported to the installation site. This is one reason for its cost increase over other options. 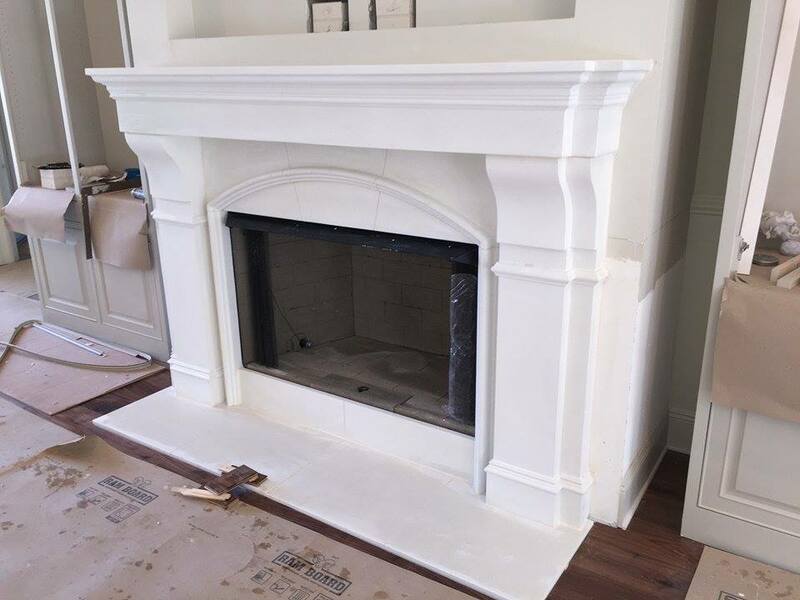 Another concept which is increasing in popularity is the use of adobe, plaster, and drywall for fireplaces. These materials offer a great deal of design versatility such as modernistic straight, simply curvy, and elegant angular lines. Many home owners today are opting to have hearths seamlessly integrated into the wall. This concept is the blending from floor to ceiling using smooth running lines. Wooden materials used for fireplaces must be produced from high quality sources in order to withstand the level of heat that the firebox will emit. Wood sourced from Cherry or Rosewood for example will likely take the heat much better than cheap materials such as chipboard or pressboard. Beautiful and unique designs can be created by incorporating metal work into fireplace mantles and surrounds. These techniques can be used in conjunction with wood, plaster, stone, and rock to produce various effects for different looks. This artistry can provide a medieval décor in the living room, family room, or even a bedroom. Eco-friendly practices are on the rise among business and home owners alike. Fireplace surrounds and mantles are often rescued from older homes to be installed into modern models. These pieces are most commonly produced from wood; however, it is not the only material that was used in times past. Recycled mantles and surrounds can offer a traditional rustic touch or a Victorian flair.